We describe a cell-based assay to report on HIV-1 fusion via the expression of green fluorescent protein detectable by flow cytometry or fluorescence microscopy. It can be used to test inhibitors of viral entry (specifically at the fusion step) in cell-free and cell-to-cell infection systems. Esposito, A. M., Soare, A. Y., Patel, F., Satija, N., Chen, B. K., Swartz, T. H. A High-throughput Cre-Lox Activated Viral Membrane Fusion Assay to Identify Inhibitors of HIV-1 Viral Membrane Fusion. J. Vis. Exp. (138), e58074, doi:10.3791/58074 (2018). This assay is designed to specifically report on HIV-1 fusion via the expression of green fluorescent protein (GFP) detectable by flow cytometry or fluorescence microscopy. An HIV-1 reporter virus (HIV-1 Gag-iCre) is generated by inserting Cre recombinase into the HIV-1 genome between the matrix and the capsid proteins of the Gag polyprotein. This results in a packaging of Cre recombinase into virus particles, which is then released into a target cell line stably expressing a Cre recombinase-activated red fluorescent protein (RFP) to GFP switch cassette. In the basal state, this cassette expresses RFP only. Following the delivery of Cre recombinase into the target cell, the RFP, flanked by loxP sites, excises, resulting in GFP expression. This assay can be used to test any inhibitors of viral entry (specifically at the fusion step) in cell-free and cell-to-cell infection systems and has been used to identify a class of purinergic receptor antagonists as novel inhibitors of HIV-1 viral membrane fusion. The need for novel antiretroviral therapies has prompted the developement of high-throughput screens for inhibitors of HIV-1 entry. The Gag-iCre reporter assay is developed to identify inhibitors of viral entry at the fusion step in a cell-to-cell infection system by specifically measuring viral membrane fusion with the host cell membrane1. An assay was developed to screen for novel inhibitors that acted specifically at the early stages of HIV-1 infection up to the point of viral membrane fusion. One challenge to measuring cell-cell infection is that the initial inoculum contains infected donor cells and ininfected target cells, so measuring new infection is difficult to discriminate from the input cells. The ideal system would involve a heterologous gene marker that can be induced by the initiation of a target cell infection and is not present in the donor cell. A popular viral contents mixing assay based on a viral protein-enzyme fusion, BlaM-Vpr, can be effective, but has limitations for high throughput, cell-cell screening2. This assay involves a beta-lactamase (BlaM) reporter gene that is fused to HIV-1 Vpr, packaged into virions, and delivered into target cells upon viral membrane fusion. The substrate CCF2-AM is loaded into the cytoplasm of target cells and undergoes a fluorescence shift upon cleavage. The CCF2-AM substrate is expensive and can be prohibitive for high-throughput screens. In order to distinguish donor and target cells, it is necessary to dye-label the target populations. Finally, the protocol requires several wash and incubation steps which can be burdensome and costly when testing large numbers of compounds. The Gag-iCre assay was developed as a solution to these issues, to develop a high-throughput screening for inhibitors of fusion in cell-to-cell transmission. This system does not require substrate to be loaded into cells. The assay can also be used for cell-free studies and is adaptable to other viral fusion studies using pseudo-typed HIV-1 Gag-iCre virus particles. HIV Env mediated cell-cell fusion assays can measure virus Env protein-mediated cell fusion, however these do not use actual virus particles as the HIV-1 Gag-iCre assay does3,4,5. This assay can be read with flow cytometry or fluorescence microscopy. It has been successfully used to screen the FDA library as well as a small library of purinergic inhibitors1,6. Other investigators have also identified purinergic inhibitors in HIV-1 fusion using an adapted and optimized high-throughput fusion assay that reports the transfer of virus-encapsulated beta-lactamase into the cytoplasm7,8. The Gag-iCre virus was designed with a similar approach to the Gag-iGFP virus, inserting Cre recombinase between matrix and capsid, flanked by HIV-1 protease sites9. The Cre enzyme is made as a precursor inserted within the Gag polyprotein that matures when HIV-1 protease is activated within the nascent virus particle. The Cre delivery is, thus, dependent upon the delivery of the contents of a protease-activated HIV-1 particle into a target cell via a viral membrane fusion process. Two versions of the protocol are provided here. The first uses an HIV-1 infected population to infect target cells, to study direct cell-to-cell transmission of HIV. The second version uses a cell-free virus to study a cell-free viral infection. The cell-to-cell transmission assay takes 7 days to complete from the day the cells are thawed, or 5 days if the cells are already thawed and passaged. The cell-free infection assay can be performed in 5 days if the cells need to be thawed and 3 days if the cells are thawed and passaged. Instructions are also given to generate an RG (red-to-green) target cell line in the desired cell type (if a preexisting RG target cell line is not being used) using a plasmid created by the Clevers Lab10. It is recommended that appropriate biosafety precautions are taken with the virus and the virus-expressing cells in this assay. We conduct the infectious portion of this assay in a BSL2+ tissue culture facility. After the cells are fixed, they can be analyzed in standard flow cytometry and microscopy facilities. Here we describe the application of this assay to screen for novel compounds that inhibit HIV-1 viral membrane fusion (Figure 1). Purinergic receptors are pro-inflammatory mediators. Our laboratory has demonstrated that non-selective inhibitors of purinergic receptors act as inhibitors of HIV-1 viral membrane fusion6. We report that the utilization of this assay in high throughput can identify novel HIV-1 viral membrane fusion inhibitors. We demonstrate that an inhibitor of the purinergic class of receptors represents a novel class of HIV-1 viral membrane fusion inhibitors. NOTE: This step is optional; if using an existing RG target cell line, start at step 2. Cotransfect a 70% confluent 10 cm plate of 293T cells11 [in 10 mL of Dulbecco's modified Eagle's medium (DMEM) with 10% fetal bovine serum (FBS)] with pMSCV-loxp-dsRed-loxp-eGFP-Puro-WPRE10 and pCL-10A112 (packaging plasmid) in a 1:1 ratio (20 µg total) using calcium-based transfection13. Harvest 10 mL of viral supernatant 48 h post-transfection by pipetting the media from the plate into a 15 mL conical tube and centrifuging the tube at 3,000 x g for 5 min at 23 °C to pellet any cell debris. Attach a 0.45 µm filter to a 10 mL syringe. After centrifugation, take the entire supernatant and load the syringe. Run the sample through into a clean 15 mL tube. Aliquot the filtered viral supernatant into appropriate sizes (usually, 0.5–1 mL aliquots). These can be used immediately in the next step or can be frozen at -80 °C and stored. Use 50–100 µL of viral supernatant to infect a cell line of choice in a 96-well plate. Culture the cells at 37 °C with 5% CO2. The RFP signal should appear in as soon as 24 h under a fluorescence microscope (40X magnification, 532 nm excitation, 588 nm emission) but may take up to 72 h.
NOTE: In these experiments, Jurkat cells were used, but other types may be used as well. Select transduced cells with puromycin by setting up a series of 10 wells and adding puromycin to each, leaving at least 1 well untreated as a control (use a range of concentrations from 0.5 µg/mL to 5 µg/mL; this may vary per cell type). Monitor the cell viability (cell lysis will occur in cells without puromycin resistance) over the course of several days compared to the untreated control and use a concentration of puromycin where only RFP-expressing cells survive. NOTE: Select the concentration where untransfected cells are killed while transfected cells survive. Using either single-cell flow cytometry sorting or a limiting dilution (see steps 1.8–1.10), grow cultures derived from single cells1 to develop a clonal cell line (this may take several weeks to grow). If using the dilution method, count the cells using a hemocytometer and dilute the sample to approximately 500 cells/mL. In a 96-well plate, pipette 50 µL of the cell dilution into 50 µL of media [Roswell Park Memorial Institute (RPMI) medium with 10% FBS and 2% penicillin-streptomycin, if using Jurkat cells] and perform 1:1 serial dilutions into 11 wells containing 50 µL of media. For the best results, perform at least 10 replicates. Monitor the cell growth via microscopy (40X) of the plate in a tissue culture incubator (37 °C with 5% CO2) or approximately 4 weeks. Choose cultures from the lowest puromycin concentration with growth (as seen via microscope, 40X) for the clonal cultures. Freeze the aliquots by centrifuging 20 mL of the culture (500,000 cells/mL, counted with a hemocytometer) at 800 x g for 5 min at 23 °C and resuspending it in 500 µL of FBS with 10% DMSO. Place it at -80 °C using a cell-freezing container and then store it in liquid nitrogen. Thaw one 500 µL vial of Jurkat RG reporter cells by placing it into a 37 °C water bath. Pipette the cells from the vial into 10 mL of RPMI complete medium and then centrifuge the mixture at 800 x g for 5 min at 23 °C. Resuspend the pellet in 20 mL of RPMI complete medium in a T-75 flask. Incubate the flask overnight (37 °C and 5% CO2). NOTE: RPMI complete medium contains RPMI 1640, 10% FBS, 2 mM L-glutamine, 100 units/mL penicillin, and 100 mg/mL streptomycin. The next day, add 0.5 µg/mL of puromycin (1 µL of a 2 mg/mL stock per 8 mL of media). Culture the cells, maintaining a density of 200,000–800,000 cells/mL (counted via hemocytometer). The day before setting up the transfer assay, split the cells down to 200,000–400,000 cells/mL in fresh RPMI medium containing 0.5 µg/mL of puromycin. Thaw untransduced Jurkat cells and culture them in a T-75 flask with 20 mL of RPMI complete medium (as described in step 2.1), keeping a density of 200,000–800,000 cells/mL. Centrifuge 7,500,000 cells (800 x g for 5 min) and resuspend them in 120 µL of nucleofection solution V with supplement (see Table of Materials). Transfer the cells to an electroporation cuvette and add 4.5 µg of Gag-iCre1 DNA. Transfect the cells (via an electroporation-based approach, see the Table of Materials) using an appropriate program (e.g., S-18) and then immediately transfer them to 3 mL of RPMI medium (with 10% FBS). Allow the cells to recover by incubating them overnight at 37 °C with 5% CO2. The next morning, centrifuge the cells at 800 x g for 5 min at 23 °C and resuspend them in 3 mL of RPMI complete medium, allowing them 2 h to recover at 37 °C (5% CO2) before proceeding with the assay set-up. Count the cells using a hemocytometer then spin down 50,000 cells (800 x g for 5 min at 23 °C) per well to be assayed (of both donor and target cells). Resuspending 1 x 106 cell/mL in RPMI complete without puromycin. In one plate, add 25 µL of donor cell suspension to each well; in another plate, add 25 µL of target cells. To each well, add 25 µL of the test compound diluted in RPMI complete medium at the appropriate concentration. Incubate the donor and target cells with the compound for 30 min. NOTE: The concentration will vary per drug. If it has a known IC50, use this as a starting point, titrating above and below. If the IC50 is unknown, prepare a 200 µM stock for a final concentration of 10 µM. After the pretreatment, combine the donor cells with the target cells by pipetting the contents of one plate into the other and incubate the cells for 40 h in a tissue culture incubator at 37 °C with 5% CO2. Add paraformaldehyde (PFA) to each well to a final concentration of 2%. NOTE: For a 16% stock solution, this is 14 µL per 100 µL well. CAUTION: PFA is harmful to exposed skin and eyes. Wear a lab coat, gloves, and safety goggles, and handle the stock solution in a safety hood. Read the cells on a flow cytometer with mCherry and FITC channels. NOTE: It is possible to see 5–20% of the cells expressing GFP above background in the infected cells vs. uninfected cells. Visualize the GFP signal via fluorescence microscopy (40X) on GFP-specific channels (with an excitation filter of 400 nm and an emission filter of 508 nm). Thaw one 500 µL vial of Jurkat RG reporter cells by placing into a 37 °C water bath. Pipette the cells from the vial into 10 mL of RPMI complete medium and then centrifuge the RPMI complete medium at 800 x g for 5 min at 23 °C. Resuspend the pellet in 20 mL of RPMI complete medium in a T-75 flask. Incubate the flask overnight (37 °C and 5% CO2). Transfect a 70% confluent 10 cm plate of 293T cells11 (in 10 mL of DMEM with 10% FBS) with 5 µg of Gag-iCre1 plasmid using calcium-based transfection13. NOTE: This scale will produce 10 mL of virus, which is enough for approximately two to four 96-well plates, depending on the efficiency of the transfection. Harvest the entire viral supernatant at 48 h by pipetting the media from the plate into a 15 mL conical tube and centrifuging the tube at 3,000 x g for 5 min to pellet all cell debris. Use the virus to infect target cells immediately (step 3.3) or freeze and store the virus at -80 °C (thaw the sample as needed before use). Count the RG Jurkat target cells (from step 3.1.3) using a hemocytometer and spin down 50,000 target cells per well at 800 x g for 5 min, resuspending the cells at 1 x 106 cells/mL in RPMI complete medium without puromycin. In one plate, add 25 µL of RG Jurkat target cells to each well; in a separate plate, add 25 µL (2 ng) virus to each well. To each well, add 25 µL of the test compound, diluted in media at the appropriate concentration. Incubate the cells and the virus with the compound for 30 min. NOTE: The test concentration will vary per drug. If it has a known IC50, use this as a starting point, titrating above and below. If unknown, prepare a 200 µM stock medium for a final concentration of 10 µM. After the pretreatment, add the entire content (50 µL) of the virus/compound mix from the wells to the target cells and incubate everything for 40 h in a tissue culture incubator at 37 °C with 5% CO2. Add PFA to each well to a final concentration of 2%. Read the cells on a flow cytometer with mCherry and FITC channels. The GFP signal can also be visualized via fluorescence microscopy on GFP channels. NOTE: Once can expect to see 5–20% of the cells expressing GFP above background in the infected cells vs. the uninfected cells. Uninfected RG Jurkat Cells exhibit a low level of background GFP signal (0.3%) with a very strong RFP signal (Figure 2A, uninfected column). The infection with Gag-iCre causes an increase in GFP signal (24.9%,) while the presence of the HIV-1 fusion inhibitor AMD3100 (20 µM) inhibits the development of this signal, bringing it down to uninfected background levels (0.34%). When an inhibitor of a post-fusion event such as the reverse transcription inhibitor AZT (2 µM) is used, the signal is not affected significantly (23.5%), indicating that the GFP signal produced by the assay is specific to HIV-1 fusion. Figure 2B indicates a dose-dependent inhibition of Gag-iCre fusion with PPADS (100 µM), a non-selective purinergic inhibitor. Figure 3 indicates a comparison of cell-free HIV-1 viral membrane fusion using the Gag-iCre assay (Figure 3A) and the convention BlaM-Vpr assay (Figure 3B). A titration of Gag-iCre and BlaM-Vpr viruses was used to spinoculate—a 2 h long 1,200 x g spin of the 96-well infection plate at the beginning of the infection to increase its efficiency—RG Jurkat cells with Gag-iCre and Jurkat cells with the BlaM-Vpr virus as previously described2. At 3 ng of the virus, both assays offered a robust signal of 64.7% (Gag-iCre) and 47.2% (BlaM-Vpr) of the cells were fused. At 0.3 ng of the virus, the signals were 1.18% (Gag-iCre) and 2% (BlaM-Vpr). These data suggest that Gag-iCre can offer a comparable signal for viral fusion to the well-established BlaM-Vpr assay at a range of virus concentrations. Figure 1: Gag-iCre assay overview. RG Jurkat cells are co-incubated with donor Jurkat cells transfected with HIV Gag-iCre. 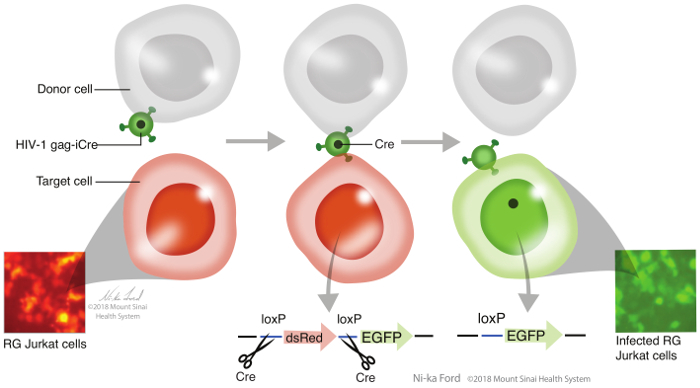 Upon viral membrane fusion, the Cre is released into the target cells, which can cleave the dsRed gene at the loxP sites to allow EGFP expression, resulting in the cells fluorescing green. Please click here to view a larger version of this figure. 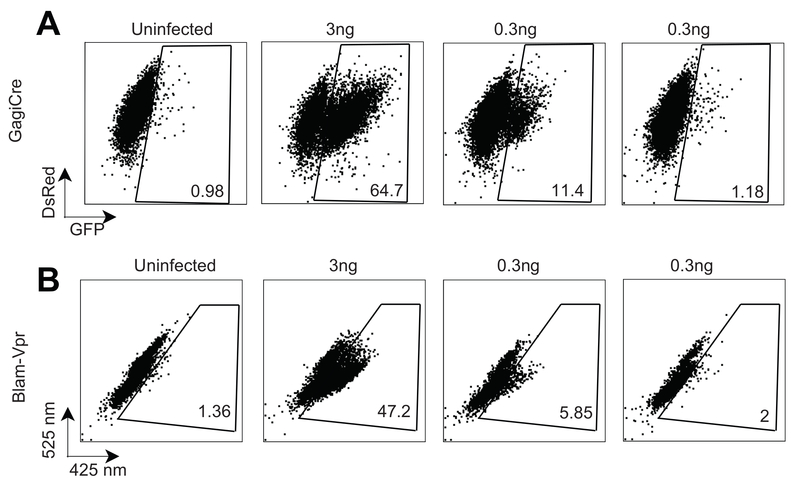 Figure 2: Representative results from a cell-free and a cell-to-cell Gag-iCre infection. (A) Cell-free Gag-iCre fusion is inhibited by the fusion inhibitor AMD3100, but not by the reverse transcription inhibitor AZT. These panels show uninfected RG Jurkat cells, untreated RG Jurkat cells 48 h after the infection, and RG Jurkat cells 48 h after the infection but treated with AMD3100 or AZT, as indicated. The upper panels represent fluorescent micrographs on the GFP channel, the middle panels represent fluorescent micrographs on the RFP channel, while the lower panels represent fluorescence-activated cell sorting (FACS) data for samples showing GFP positive of a percentage indicative of fusion. Scale bar = 100 µm. This panel has been modified with permission from Esposito et al.1. (B) The HIV-1 viral membrane fusion following cell-to-cell infection is inhibited by PPADS. RG Jurkat cells were mixed with Jurkat cells transfected with HIV-1 Gag-iCre, and the inhibitors AMD3100 and PPADS were tested for their ability to block viral membrane fusion at 100 µM, as shown in representative fluorescence-activated cell sorter plots. This figure has been modified from Swartz et al.6. Please click here to view a larger version of this figure. Figure 3: HIV Gag-iCre reporter signal is comparable to BlaM-Vpr. These panels show the results of a FACS analysis of (A) RG cells spinoculated with a Gag-iCre virus and (B) Jurkat cells spinoculated with NL43 BlaM-Vpr, 16 h after a 6 h infection at the indicated concentration of the virus. This panel has been modified with permission from Esposito et al.1. Please click here to view a larger version of this figure. The Gag-iCre assay has proven to be very useful for screening drug candidates which may inhibit the fusion step of viral replication. When performing this assay, the most important steps to get a good signal are similar to most viral infection assays. The first critical step is producing high titers of good-quality virus. This step requires that the 293T cells are passaged frequently (at least 1x every 48 h) so they do not become overconfluent and clump together. Additionally, it may be worth experimenting with different transfection methods, as some researchers find that calcium-phosphate transfection gives better results, while others favor lipid-based reagents. Similarly, the other critical step in this protocol is to not let the target cells overgrow but to keep them in the exponential growth phase right before the infection, as the stationary phase reduces their ability to be infected. Compared to the well-established BlaM-Vpr assay2, the Gag-iCre assay offers a substrate-free assay with no need to label target cells. This makes it well suited for certain high-throughput applications1. Additionally, the assay provides a permanent marker for viral entry even if the cell becomes latent, offering some potential to study latent infection. Future studies for latency may utilize this system in mice where RG cells which have been switched to green due to Gag-iCre exposure, yet are not productively infected, could be isolated to study the cell populations with a latent virus or nonproductive infection. In addition to latency, the assay has other potential applications. It has been successfully utilized for pseudo-typing with other viral envelope proteins such as Ebola and VSV (unpublished data), opening up the potential for this assay to identify fusion inhibitors for a variety of viruses in a safer manner than working with a live virus. One potential limitation of the Gag-iCre assay is that it does take an additional day for the signal to develop, compared to BlaM-Vpr. In addition, the Gag-iCre virus in its current state only replicates for a single cycle, which works for drug screening under the conditions we have described but would not be suitable for long-term studies or growth curves. In the future, new versions of the assay will be made with different reporter signals, such as luciferase, allowing for a wider variety of uses. Further, the screening of larger compound libraries will likely yield novel inhibitors specific to the fusion step of viral replication. This research was supported by grants NIH/NIAID AI112423 and NIH/NIGMS GM113885 to Benjamin K. Chen and NIH/NIAID K08-AI120806 to Talia H. Swartz. We would like to thank the Icahn School of Medicine at Mount Sinai Dean's flow Cytometry CORE. pMSCV-loxp-dsRed-loxp-eGFP-Puro-W PRE Addgene 32702 Koo BK et al. Controlled gene expression in primary Lgr5 organoid cultures. Nature Methods 9:81-83 (2011). Gag-iCre Benjamin Chen Lab Esposito AM et al. A high throughput Cre-lox activated viral membrane fusion assay identifies pharmacological inhibitors of HIV entry. Virology 490:6-16 (2016). Esposito, A. M., et al. A high throughput Cre-lox activated viral membrane fusion assay identifies pharmacological inhibitors of HIV entry. Virology. 490, 6-16 (2016). Cavrois, M., De Noronha, C., Greene, W. C. A sensitive and specific enzyme-based assay detecting HIV-1 virion fusion in primary T lymphocytes. Nature Biotechnology. 20, 1151-1154 (2002). Huerta, L., Lamoyi, E., Baez-Saldana, A., Larralde, C. Human immunodeficiency virus envelope-dependent cell-cell fusion: a quantitative fluorescence cytometric assay. Cytometry. 47, 100-106 (2002). Sakamoto, T., et al. Establishment of an HIV cell-cell fusion assay by using two genetically modified HeLa cell lines and reporter gene. Journal of Virological Methods. 114, 159-166 (2003). Herschhorn, A., et al. An inducible cell-cell fusion system with integrated ability to measure the efficiency and specificity of HIV-1 entry inhibitors. PLoS One. 6, e26731 (2011). Swartz, T. H., Esposito, A. M., Durham, N. D., Hartmann, B. M., Chen, B. K. P2X-selective purinergic antagonists are strong inhibitors of HIV-1 fusion during both cell-to-cell and cell-free infection. Journal of Virology. 88, 11504-11515 (2014). Marin, M., et al. High-Throughput HIV-Cell Fusion Assay for Discovery of Virus Entry Inhibitors. Assay and Drug Development Technologies. 13, 155-166 (2015). Giroud, C., et al. Screening and Functional Profiling of Small-Molecule HIV-1 Entry and Fusion Inhibitors. Assay and Drug Development Technologies. 15, 53-63 (2017). Hubner, W., et al. Sequence of human immunodeficiency virus type 1 (HIV-1) Gag localization and oligomerization monitored with live confocal imaging of a replication-competent, fluorescently tagged HIV-1. Journal of Virology. 81, 12596-12607 (2007). Koo, B. K., et al. Controlled gene expression in primary Lgr5 organoid cultures. Nature Methods. 9, 81-83 (2011). Pear, W. S., et al. Production of high-titer helper-free retroviruses by transient transfection. Proceedings of the National Academy of Sciences. 90, 8392-8396 (1993). Naviaux, R. K., Costanzi, E., Haas, M., Verma, I. The pCL vector system: Rapid production of helper-free, high titer, recombinant retroviruses. Journal of Virology. 70, 5701-5705 (1996). Kingston, R. E., Chen, C. A., Okayama, H. Calcium Phosphate Transfection. Current Protocols in Immunology. 10, 10-13 (2001).